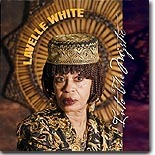 Why, oh why, isn't Lavelle White recorded more frequently than every five years or so? Her latest, Into The Mystic, this month's Pick Hit, will have you asking the same question. Guy Davis takes to the "rails" with his sixth CD on Red House Records, Chocolate to the Bone. It's this month's Surprise pick. Our Flashback feature this month takes a second look at what the reviewer refers to as one of the most perfect blues discs ever recorded. It was the inspired combination of Albert Collins, Johnny Copeland and Robert Cray --- Showdown! This month's What's New section features a match-up of three hot guitarists --- Tommy Castro, Jimmy Hall & Lloyd Jones --- plus reviews of new CDs from The Paladins, The Persuasions, Walter Trout, young Jimmy Bowskill, and more. We also include three discs from Peter Green and more reviews of by-products from The Blues series.